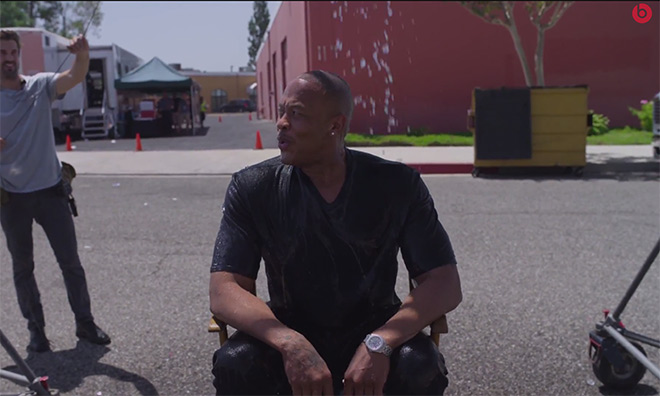 The ice bucket challenge to raise awareness and funds for the ALS Association continued at Apple on Monday, with Dr. Dre accepting CEO Tim Cook's dare on the set of his upcoming movie "Straight Outta Compton." Posted to the Beats by Dre YouTube channel, the video shows Dre getting soaked with the help of director Gary Gray, who is working with the rapper and new Apple employee on the upcoming NWA biopic "Straight Outta Compton," to be released next year. Dre, whose real name is Andre Young, came out seemingly unfazed after taking on ice cold water from a 50 gallon bucket. Like viral video of Microsoft founder Bill Gates, Dre rigged a special apparatus to hold the bucket, with Gray doing the honors of tipping over the huge trash can with a rope. As per the game's rules, Dre challenged Eminem, Snoop Dogg and Kendrick Lamar to get doused, donate to ALSA or both. The first Apple exec to take on the ice bucket challenge was marketing chief Phil Schiller last week. Schiller nominated Cook, who made good on the deal at a beer bash on Apple's campus and subsequently challenged Dre, Disney chief Bob Iger and musician Michael Franti. Those interested in donating to the cause —with or without ice water —can do so via the association's website.